Chances are you're sitting in a coffee shop, sipping hot chai, and reading a yoga magazine. You may have just finished your favorite yoga class, and you feel really good. A great workout it may have been, and yet deep inside you know that there must be more to yoga than alignment, anatomy, and many comments about being "grounded," "centered" and "balanced." And you're right. Yoga is much, much more. The postures are but one component of a complex system of spiritual psychology, a practical philosophy whose source is India's 5000-year-old jewel of collected knowledge, the Vedas. Widely believed to be divinely inspired, the Vedas are oral teachings, preserved for generations by flawless memorization and precise repetition. From teacher to student, and parent to child, the sacred sounds of Vedic chanting have been an integral part of Indian life for centuries. And the Vedas are vast. Through songs, chants, poems, myths and fables, humankind's epic battles and inner struggles are told and retold again and again. The inclu-siveness of this great work is captured by the Indian adage, "If you lose your cow, you can find it in the Vedas." In order to bring organization and clarity to these expansive teachings, great sages extracted from the Vedas six philosophies, or darsanas. The root of darsana means "to see," and they include six different ways of looking at life. More specifically, they are six distinct perspectives on how to reduce human suffering. Yoga is one of these six formal philosophies. The Yoga Sutras of Patanjali is the darsana of yoga. Although there are other important works on yoga, including the Bhagavad-Gita, the Hatha Yoga Pradipika, and Yoga Rahasya, the complete philosophy is understood to be embodied by Patanjali's Yoga Sutras. To understand Yoga, therefore, one must study its Sutras. There is an important distinction, however, between the word 'yoga', and the Philosophy of Yoga. 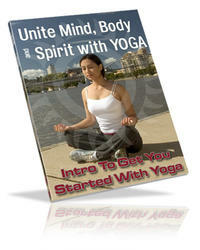 The word 'yoga' appears throughout the Vedas, and means "to link," "to join," "to yoke," or "to focus the mind." The Philosophy of Yoga is a different matter. This philosophy is a cohesive system with a specific, technical, definition of Yoga and the actions required to achieve it. While three of the darsanas are outside the scope of this article, exploring two others, Samkhya and Vedanta will help us understand what Yoga is - and isn't. Vedanta is a non-dualist darsana, and the foundation of Hinduism. Simply put, Vedanta says that "everything is all one thing." Hinduism - a theistic non-dualism - calls this one thing God. Despite the appearance of many gods, they are really only one God, Brahma. Many manifestations, one God. No duality: all are one. Philosophies of non-theistic non-dualism - Buddhism, for example - also say there is only one thing. Not God, but one thing nonetheless. Call it consciousness, wholeness, nothingness, something, but just one thing. Uncompromising and easily recognizable, non-dualism uses concepts like 'Maya' and 'illusion' to explain that anything other than oneness is not really real. For non-dualists, the root cause of human suffering is the illusion of separation. We suffer when we see ourselves as having a separate existence from the one thing, when we believe in the 'illusion.' For non-dualists, suffering ends when one realizes - slowly or suddenly, with or without tools - that it's all one. In nature, fire is rajasic. Where fire exists, form changes: paper becomes ash, wood becomes ember, and cool oxygen and organic matter become hot carbon dioxide. Humans experience this guna as anxiety, agitation, nervousness, insomnia, etc. Prakriti's second guna is tamas: slow, heavy, resistant. In the natural world, rock is tamasic. Rock changes form, but slowly and only after much pressure is applied. Tamas is resistance to change. We experience tamas as dullness, fatigue, hesitation, lethargy, doubt and depression. But like Goldilocks' porridge, one of the gunas, sattva guna, is just right. Sattva is defined as appropriate change, balanced, harmonious, clear and sustaining. According to samkhya, the true nature of the human mind is sattvic. And sattva, while still part and parcel of prakriti, is the closest that matter gets to interpretations, depending on the student's mindset. To fully benefit from these timeless teachings, one must study the Sutras with a qualified teacher, a teacher as familiar with each sutra as they are with each student's needs. In general terms, however, Yoga Philosophy maintains that the human mind can be both a valuable tool and a source of suffering. In Sutra 1:2, Patanjali defines the Yoga state as having a mind that is sattvic, stable, and able to focus. He chooses the phrase 'citta vritti nirodha' to describe a mind that can experience the truth, consciousness, and joy, which according to Yoga is our true nature. But because the mind is prakriti, it can also be rajasic or tamasic. Such an imbalanced mind is prone to misperception, resulting in sorrow, discomfort and disease.